M T D N o v e m b e r 2 0 1 8 52 Dyhrman, Nokian: Although we do not have a specific R/T- designated line, we do offer the Nokian Rockproof. is product offers commercial grade durability for off-road enthusiasts and professional driving such as logging, mining and other outdoor professions. In addition, we are always looking ahead to the next generation of tires and are con- stantly building upon and improving on our designs. Cati, Omni United: Yes, Radar Tires has a recently launched its Renegade RT+ line that has over 27 SKUs with more expected to be launched in phases by early next year. Gomez, Toyo: As far as the next-gen- eration Open Country R/T we are always looking for ways to improve our existing products and ways to continue to innovate like we have done with the Open Country R/T. Niknam, Yokohama: At Yokohama, we have created an X-version of our products to address in-between segment customers. X stands for "Xtra" or "Xtreme," depend- ing on the segments. e X-MT tire was developed to address customers with the need for extreme mud-terrain performance. Yokohama will introduce two new "X" products in 2019, which will cover the other in-between segmentation. MTD: What is the size range within the R/T segment? What is the most popular size? Mathis, Atturo: Atturo currently offers 24 sizes in our Trail Blade X/T, mixed between hard metric, LT-rated and flotation sizes covering both OE and plus sizes. e most popular size for us today is the 275/55R20 followed closely by 33x12.5R20. is is a perfect example of the versatility of the X/T pattern. It can suit an OE replacement with a more capable and impressive tread, or be an upgrade for a lied or leveled truck. Howlett, Falken: The most popular size is undoubtedly 35x12.50R20LT. A few other popular sizes that are great candidates for an R/T-type tire are 35x12.50R17LT, LT305/55R20, LT285/65R18, LT285/55R20, 35x12.50R18LT, along with many LT295 and other modern high-flotation sizes. I typically look at aermarket tire sizes with no corresponding OE fitments when considering an R/T-type tire, because we know these consumers are modifying their vehicles, and changing to larger wheels and/or tires. When there are significant sales in both A/T and M/T tire categories for a given tire size, and the rim size is that of a modern light-duty truck — at least 17 inches, but more frequently 18 inches and 20 inches, or even 22 inches-plus — we consider those tire sizes to be candidates for an R/T-type tire. Stotsenburg, Kenda: Our size range is currently from 17 inches to 22 inches, although we are considering some traditional 16-inch sizes. e 17-inch sizes are very popular as OE replacement sizes. We are seeing strong growth from the plus sizes Gode, Hankook: The R/T segment appears to follow the A/T segment, as both LT and P-metrics are available, yet some LT fitments are only found in the M/T segment. Daval, Nitto: Nitto's Ridge Grappler size lineup ranges from 30 inches to 38 inches in overall diameter with rim diameter ranging from 16 inches to 24 inches. e most popular size in the Ridge Grappler is the 35x12.50R20LT. Cati, Omni United: Since rugged-terrain tires are a combination of all-terrain and mud-terrain tires, their size range is similar to the current all-terrain and mud-terrain offerings. e two most popular sizes are 33X12.50R20 and 35X12.50R20. 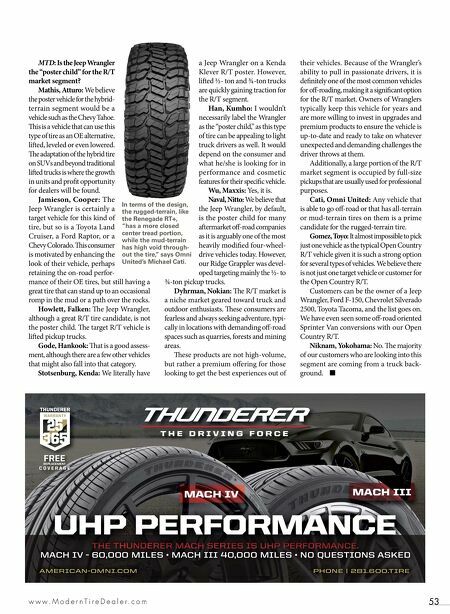 Gomez, Toyo: For industry segmenting purposes, the Open Country R/T fits into the mud-terrain segment, but when our dealers speak to customers about our tires, they very much consider it positioned between the Open Country M/T and the Open Country A/T II. e Open Country R/T has sizes ranging from a 15-inch flotation size in the 31X10.50R15 up to a 22-inch flotation size in the 37X13.50R22. Niknam, Yokohama: Flotation sizes range between 35- to 40-inch and 17-inch rim to 24-inch. REPLACEMENT OVERLAP R/T tire sizes are made up of A/T and M/T sizes "There is a huge amount of crossover in sizes among the different LT tread types," says Michael Mathis, president of Atturo Tire Corp. Here are the top five aftermarket A/T and M/T tire fitments without original equipment fitments in the market. A/T M/T 1. 35x12.50R20LT 35x12.50R20LT 2. LT285/55R20 35x12.50R17LT 3. LT285/65R18 33x12.50R20LT 4. LT305/55R20 35x12.50R18LT 5. LT275/55R20 LT305/55R20 The top five sizes of the two seg- ments combined are 35x12.50R20LT, 35x12.50R17LT, LT305/55R20, LT285/65R18 and LT285/55R20. 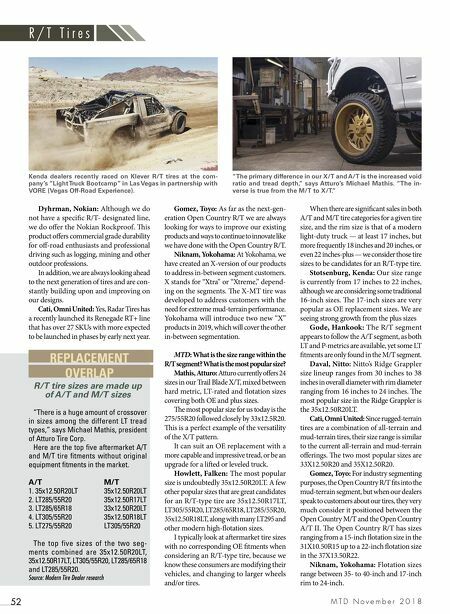 Source: Modern Tire Dealer research R / T T i r e s Kenda dealers recently raced on Klever R/T tires at the com- pany's "Light Truck Bootcamp" in Las Vegas in partnership with VORE (Vegas Off-Road Experience). "The primary difference in our X/T and A/T is the increased void ratio and tread depth," says Atturo's Michael Mathis. "The in- verse is true from the M/T to X/T."